If you want to know the pros and cons of pea protein and how it compares to other options, then you want to read this article. Pea protein is a “complete protein,” but it’s low in one vital amino acid. Unlike some plant-based protein powders, pea protein is well digested and highly bioavailable. Pea protein is almost as good as whey protein for building muscle, feeling satiated, and recovering from workouts. When it comes to protein powders, whey and casein rule the roost, racking up close to $5 billion in annual sales. They deserve the limelight, too. Research has shown time and again that they’re two of the best sources of high-quality protein that you can eat. What if you don’t want to supplement with either, though? What other options do you have? You can simply eat more whole foods, but that can be easier said than done depending on your circumstances. Many people turn to soy protein powder, but that probably isn’t optimal, and especially for men. Many others choose other popular alternatives like hemp or rice protein, and many still go in for more obscure supplements like beef or collagen protein. Pea, however, is often overlooked because of concerns about its amino acid profile, digestibility, and taste. Many people simply think that peas can’t provide them with protein that’s suitable for gaining muscle or losing fat, and that it probably tastes godawful. As you’ll see, pea protein is actually one of the best plant-based forms of protein that you can eat–on par with the best of animal-derived powders–and, when flavored and sweetened well, has a uniquely pleasant taste. Is Pea Protein a “Complete” Protein? Pea protein is more or less what it sounds like: protein extracted from peas. Specifically, it’s obtained by drying and grounding peas into a fine flour, mixing it with water, and removing the fiber and starch, leaving mostly protein with a smattering of vitamins and minerals. To fully answer this question, we need to start the discussion with amino acids. Amino acids are the building blocks of protein and thus every tissue in the body, including muscle tissue. The body needs 21 amino acids to stay alive, and 9 of them must be obtained from food (the rest can be synthesized by the body from other molecules). These nine are known as “essential amino acids, or EAAs, and one in particular, leucine, is especially related to muscle building, which is why research shows that the leucine content of a meal directly affects the amount of muscle growth that occurs as a result. In other words, high-leucine foods have a higher muscle-building potential than low-leucine foods. Researchers at MIT debunked this claim a couple decades ago and proved that all vegetable proteins contain all essential amino acids. That said, they also found that some sources of protein are lower in certain essential amino acids than others. For example, popular sources of animal protein like dairy and meat are rich in EAAs, making them extremely popular among people looking to improve their their body composition, whereas the protein found in many vegetables aren’t, making them less conducive to muscle gain. Pea protein, however, is a standout exception because it’s rich in all nine essential amino acids except for methionine, which is easy to correct for by including small amounts of animal protein in your diet or even other plant proteins like rice protein. As I mentioned above, pea protein is unique in that it’s rich in essential amino acids, and in branched-chain amino acids (BCAAs) in particular. 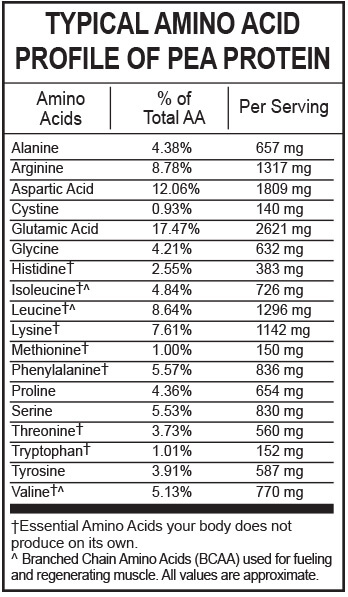 As you can see above, pea protein is about 9% leucine by weight, which is fantastic for muscle building purposes (whey, for example, is 10 to 11% leucine by weight), and contains significant amounts of most other essential amino acids as well. This is one of the reasons why research shows that people can gain just as much muscle with a pea protein supplement as with a whey powder. Another reason why pea protein deserves praise is it’s almost pure protein. Specifically, pea protein isolate is about 85% protein, 7% fat, 3% carbohydrate, and 5% vitamins and minerals. In comparison, whey protein isolate is the purest form of protein you can buy, and it’s about 90% protein by weight. Pea protein also digests slowly, which makes it perfect for taking before you go to bed, and which may also make it better for improving body composition over time than faster-digesting options like whey. Specifically, there’s evidence that slower-digesting proteins are better for muscle growth over the long term due to how your body’s muscle-building machinery processes amino acids into muscle tissue. Lastly, pea protein is also quite filling, making it an easy meal replacement if you need an on-the-go snack. Practically speaking, this isn’t an issue because methionine is abundant in many other foods that people generally like to eat, like chicken, oats, and eggs. It would only present a problem if pea protein were more or less your only source of protein and you didn’t eat other foods that provided sufficient amounts. If you’re getting your protein from a variety of sources, though, or otherwise eating methionine-rich foods, then you have nothing to worry about. Another common criticism of pea protein is that it isn’t easily digested and absorbed due to “antinutrients” and other inherent deficiencies. Antinutrients are compounds that interfere with the absorption of other nutrients, like protein, vitamins, and minerals, and they tend to be much higher in plant foods than animal. These substances are naturally present in peas, but they’re more or less completely eliminated through the standard processes used to create pea protein isolate. Studies also show that pea protein is highly bioavailable, almost equally to animal protein, so antinutrients clearly aren’t causing problems. You may have also heard that pea protein is more likely to produce allergic reactions than other plant-based proteins. While this is technically true, pea allergies are very rare, which is why pea protein is often recommended as a source of protein for people with allergies to more widely eaten foods like soy or dairy. Lastly, many people think that because peas make them bloated, pea protein will do the same. Fortunately, most of the substances naturally present in peas that cause this aren’t present in pea protein isolate, so this really isn’t a concern. Not all pea protein powders are the same. Pea protein is one of the unsung heroes among plant-based protein powders. It’s mostly protein by weight. It’s well digested and absorbed. 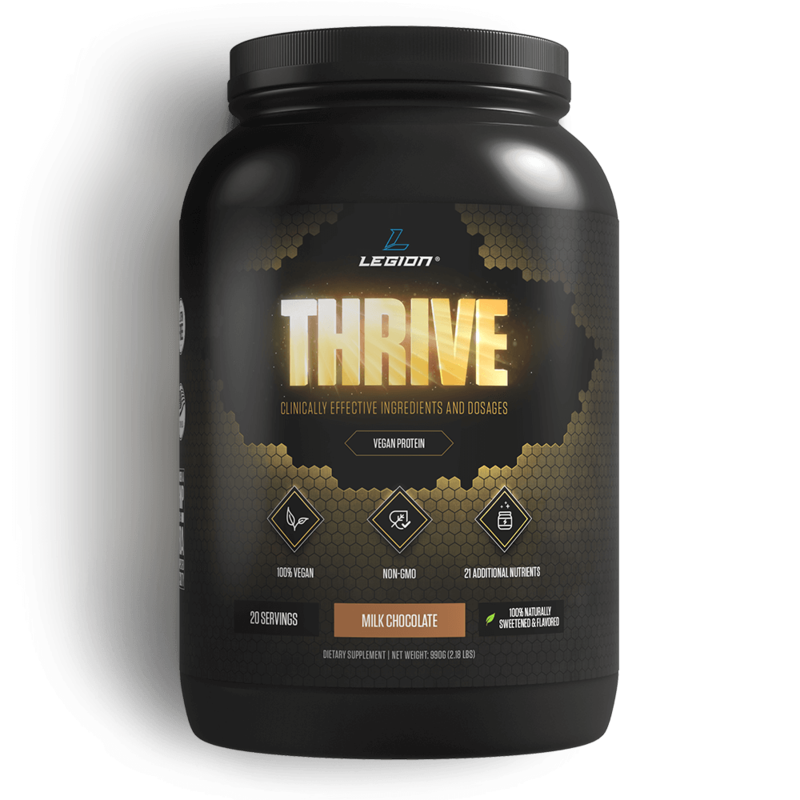 It’s a “complete” protein and contains an abundance of most essential amino acids, including leucine. Its Achilles heel is the amino acid methionine, which it’s short on, but this is easily mitigated by eating a balanced diet. All this is why a pea protein powder is just as viable of an option for supplementation as anything else, including the heavy hitters like whey and casein. What’s your take on pea protein? Have anything else you’d like to share? Let me know in the comments below!